This itinerary can be completely customised to make it a perfect fit for your dream Italian getaway. Arrive Rome and meet your chauffeur for a private car transfer to your hotel. That evening you’ll enjoy a guided twilight stroll through Rome’s most unforgettable sites, basking in the glory of the Trevi fountain, the Spanish steps and some of Rome’s most beautiful piazzas. An unforgettable plunge into the glorious past of Rome, a breath-taking walk through the monumental buildings of the Eternal City which still tell us about the politics, religion, customs and ceremonies of ancient Rome. The tour covers the Colosseum, the massive ruins of the Roman Forum as well as a wonderful view of the Palatine Hill. Enter the Vatican museums before regular opening hours where you will be among the first to reach and enjoy the almost empty Sistine Chapel before the crowds arrive. Continue your private tour with the highlights of the museums and St Peters. ​Your diVino concierge/sommelier will meet you at your hotel and you'll travel via private car to Le Marche. In route stop at the unbelievably beautiful medieval fortress towns of Spoleto and Spello with free time to explore and have lunch. Check into your hand-picked accommodation followed by a sommelier guided dinner where you will learn about the fine wines and foods of the Marche region. 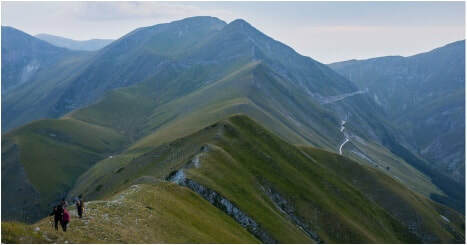 On this guided hike you will admire sweeping views across the valley of Fargno and all the way to Adriatic coast. Climbing towards Monte Castel Manardo (1917m) you will view majestic Monte Priora. Continue towards Pizzo Acuto (2035m) and Pizzo Tre Vescovi (2092m) with incredible views of Monte Priora and the impervious crest of Pizzo Berro. Arriving on the summit of Pizzo Tre Vescovi the views will open onto the the valley of Panico and the limestone walls of Monte Bove. Descending towards Forcella Angagnola we’ll arrive at the Chalet - Rifugio del Fargno where our lunch awaits us. This beautiful bike outing departs from the panoramic piazza of seaside Sirolo and leads you along dirt roads and trails towards the towns of Camerino and Poggio. 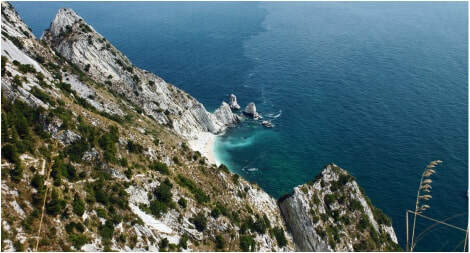 The panoramas vary between the green rolling countryside and vistas of the Conero coastline. Check in to accommodations in Portonovo with time for a swim before enjoying an amazing seafood dinner at one of Italy's finest restaurants. In the morning meet your diVino concierge and boat captain and head out for a full day sailboat outing along the beautiful Conero coast. A fresh seafood lunch with crisp organic wine will be served on board and you'll enjoy plenty of time to stop for swimming en route. On Day 8 enjoy a full free day to bask in the glory of the beautiful Conero seaside. Meet your diVino sommlier and driver and travel on to your next destination - Tuscany! 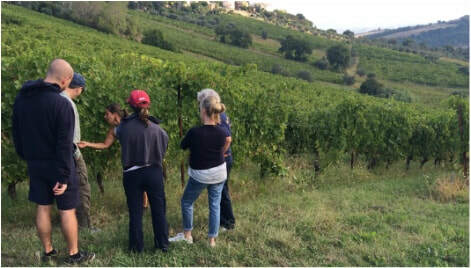 On your way however you will stop to tour a wonderful family owned organic winery in Le Marche, where you'll meet winery owners and learn about the Verdicchio grape, considered Italy's finest white wine. After lunch at charming local trattoria, paired to wines from the family estate, move on to check into accommodations in the heart of the Tuscany wine country. Departing from Pienza, one of the most perfect Renaissance towns in Italy, we'll set out through the countryside biking downhill and over easy rolling hills admiring the breathtaking scenery. to Bagno Vignoni, a tiny village whose ancient stone buildings cluster around a 150-by-90-foot pool of warm thermal waters. After your bike tour enjoy free time to explore Piena or stop in Montepulciano before returning to your hotel. Travel with your diVino sommelier to meet the owners of one of Tuscany's finest organic wineries. You will tour the historic cellars and organic vineyards, followed by a private winery luncheon paired to estate wine. In the afternoon head to Siena and enjoy some free time to explore and shop in one of Tuscany’s most breathtaking cities. Return to your hotel at your leisure. You will begin in Monteriggioni. Literally a town-in-a-castle, barely two hundred yards across, its eighty residents reside within the picture- perfect round turreted walls that crown the hilltop visible for miles around. From here, biking towards the seventeen towers of San Gimignano you will see rolling hills and many vineyards. Finish your bike tour in San Gimignano (where your chauffeur will be waiting for you) with free time to explore the cobblestoned streets, have lunch, shop and enjoy the village. Return to your hotel at your leisure. Day 13 Florence private 4-hour tour. Travel to Florence where you will meet our local historian for a 4-hour private tour. You’ll enjoy a walking tour of the historic city center with an overview of the city’s most important sites, it’s Palazzi, Piazze and Cathedral (from the outside). Then you’ll head to the Accademia museum to view Michelangelo’s David. 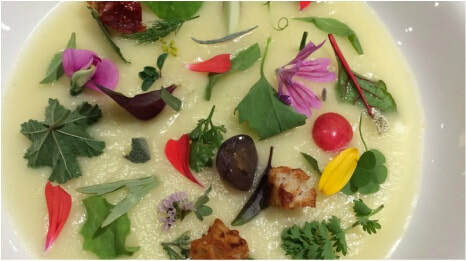 Finish your tour at a great local restaurant where your dinner reservation awaits you. Return to your hotel at your leisure. The following morning transfer to the airport for departure. This custom tour is available for your private group on your dates. We will select hotel accommodations together choosing from our hand selected properties. Maybe you love this tour but would like to customize a few details? Perhaps you’ve been to Rome before and would like to visit a new destination? Maybe you have a passion for photography or Yoga and you'd like to include that in your tour. 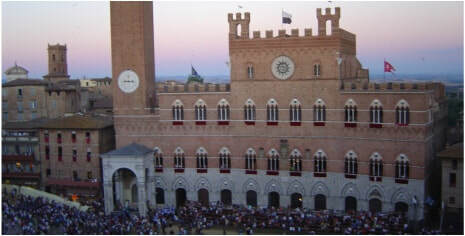 Would you like to spend an extra day in Tuscany or add an additional wine tour? No problem! Whatever your interests and passions are we can custom craft a tour that is a perfect fit for you!